Cseed made a comic a long time ago. I like it and most everything he does. So I made this for him. Not so great, but it's the thought that counts right? What are James's thoughts? Something that would require three censor bars apparently. I dunno the whole back story or whatever on everything so I put "early Philip or whoever with the blackringed eye" with James, hope that isn't illegal. 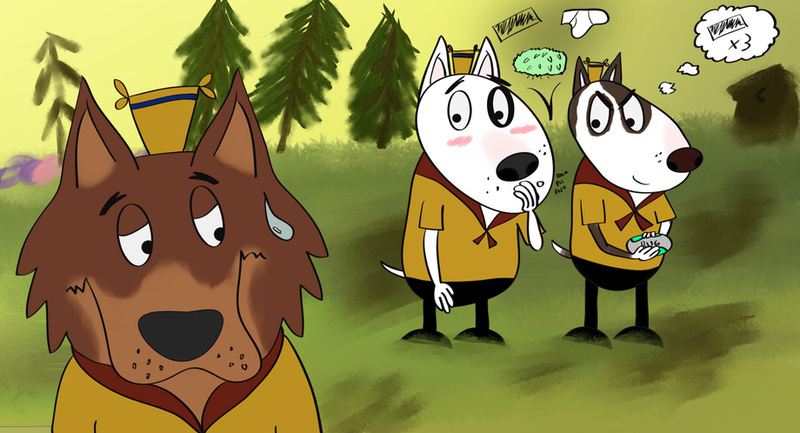 That background one is no good, maybe I'll just try to paint Camp Lazlo backgrounds instead of drawing anything else for awhile. Whats-his-face's namesake looks a bit too fucked up now that I look at it. He's supposed to be nervous but he just looks a bit melty instead.